This month, a second problem with overfitting is described: unreliable model interpretation. 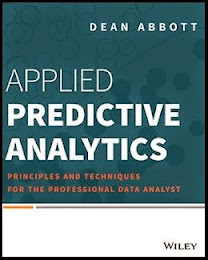 Predictive modeling algorithms find variables that associate or correlate with the target variable. When models are overfit, the algorithm has latched onto variables that it finds to be strongly associated with the target variable, but these relationships are not repeatable. The problem is that these variables that appear to be strongly associated with the target are not necessarily related at all to the target. When we interpret what the model is telling us, we therefore glean the wrong insights, and these insights can be difficult to shed once we rebuild models to simplify them and avoid overfitting. Thank you for sharing your thought. Overfitting really is a big problem when there are only few samples used to build the model. Like L4G, only 10 instances used and only one fit the target. It could be very dangerous if we train an overfitting model on these data because the model will fit those 9 wrong instances stay away from the true target. This problem will be less severe if we have enough instances. The ratio of number of instances which are not correlated to target to those are correlated will decrease significantly. In this case, it is much safer to train the model on the dataset.